Grate Hall has returned for the Storybook Fairy Houses exhibit, which is on display at Highfield Hall and Gardens June 25 – Sept. 4, 2017. Tickets ($5.00) for the 2017 FAIRY FAMILY RAFFLE may be purchased online here. After the winner is picked on Sept. 4th, the fairies will fly to their new home anywhere in the world! It’s been an exciting week in the fairy neighborhood! Every day, more wee domiciles are popping up around the grounds of Highfield Hall and Gardens in Falmouth, MA (Cape Cod). 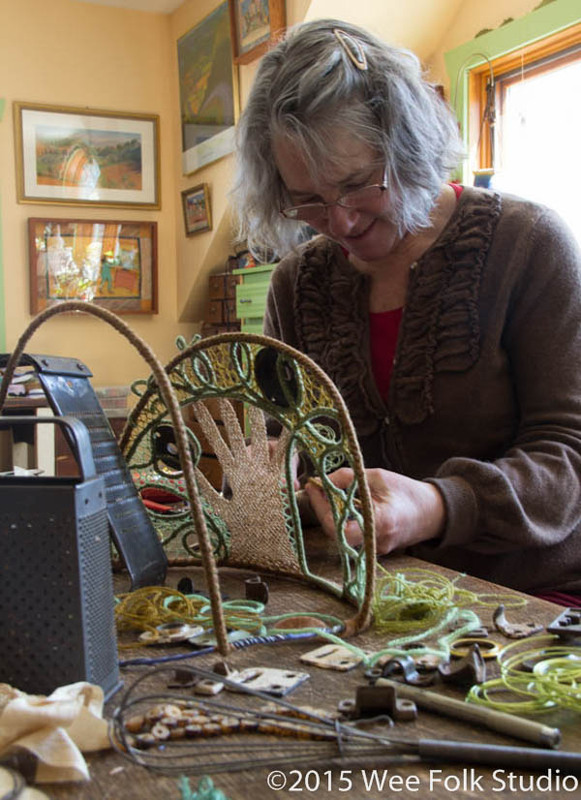 By the time the Fairy Houses of Highfield Hall exhibit opens this Sunday, June 28th at 1:00pm, there will be 32 fairy houses installed and ready to view. Just like the previous show in 2013, this display is sure to bring in many visitors from near and far! 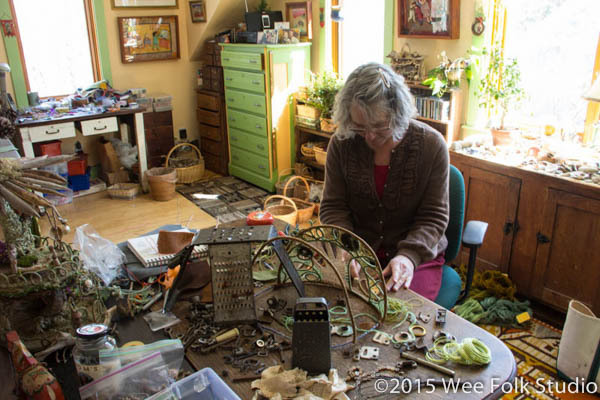 Last winter I invited 30 local artists and fairy aficionados to make houses for this summer’s exhibit. Each builder started the process by walking around the property and picking their favorite spot. They spent the next few months planning and working on their creations. I haven’t been privy to any finished houses until this week, and from what I’ve seen, this year’s collection is spectacular! 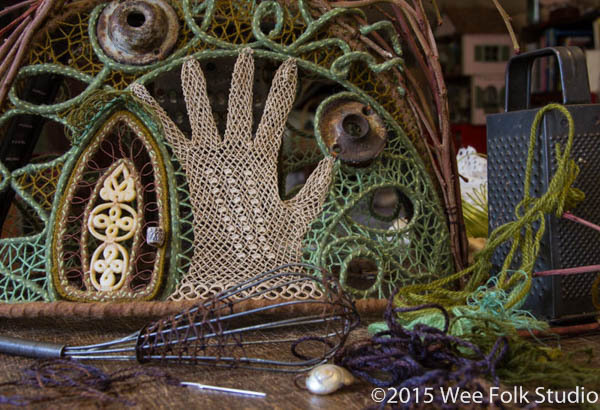 There’s a wide variety of interpretations of the “fairy house” concept, from cozy abodes to airy perches. 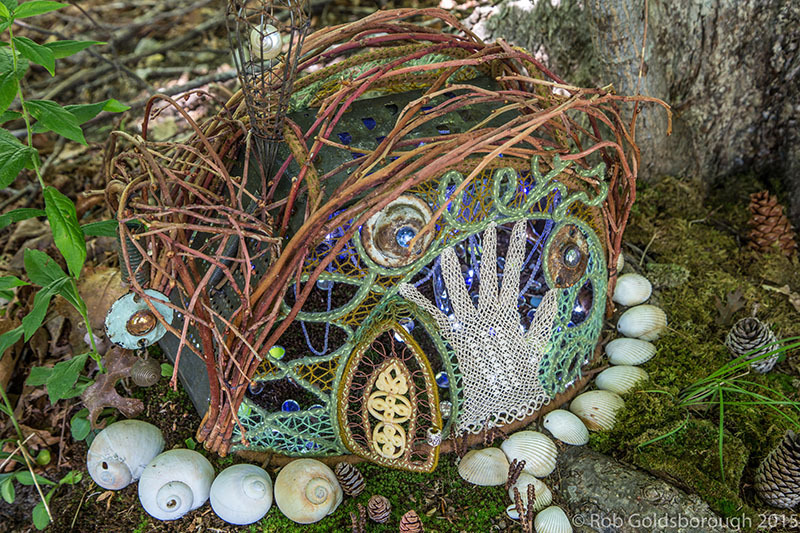 Building materials are as eclectic as the pieces themselves: clay, wood, mushrooms, paper, moss, felt, plants, shells, bark, stones, glass, metal, etc. Don’t worry if you live too far to see the originals — in the coming weeks, I’ll be sharing photos on this blog, Facebook and Instagram. 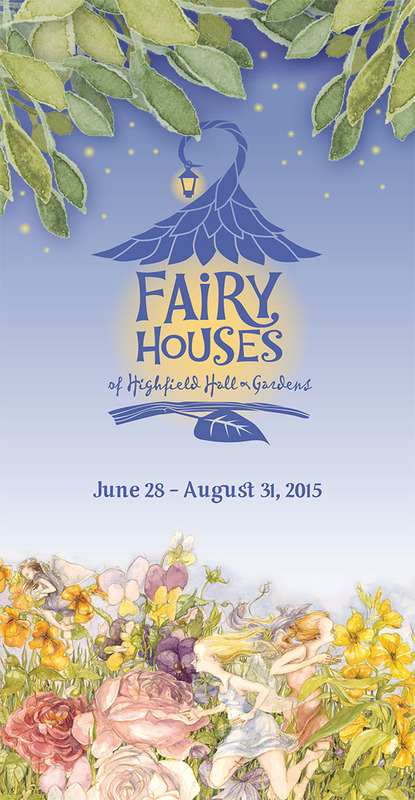 The Fairy Houses of Highfield Hall and Gardens will be on display until August 31, 2015. The exhibit is free, with a suggested donation. Stop by the hall to pick up a map with house locations and artists’ names. Inside the hall you can also see my fairy family. Raffle tickets for a chance to win the 5 doll set can be purchased online here. 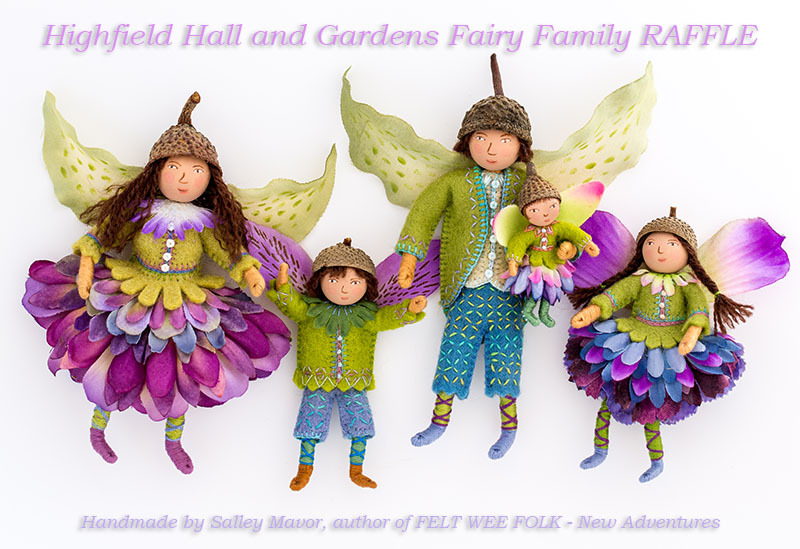 Read a post about making the fairy family here. I hope that many of you have a chance to visit this extraordinary outdoor event! 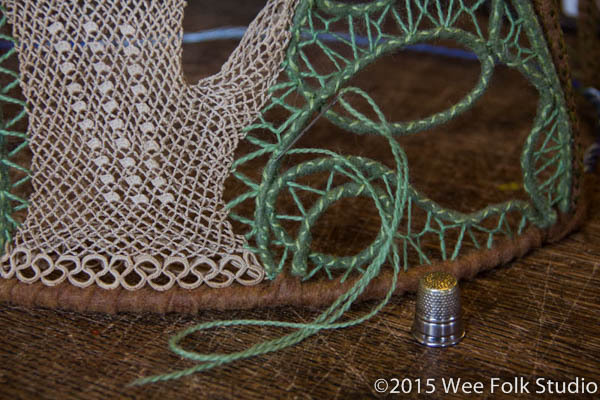 Come along, while I make my fairy house, “Great Hall”, which is pictured at the beginning of this post. 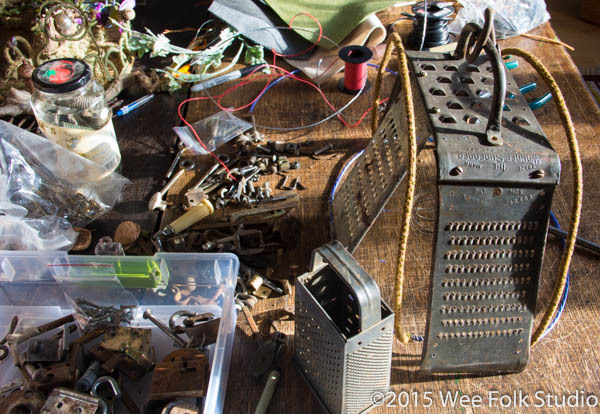 It began with a bunch of old metal graters that I saved, while cleaning out deceased relatives’ kitchens. For years I’ve been eying them for a future project and thought they’d give a solid structure to a fairy house. I drilled holes and bolted 4 of them together to make walls and a roof. 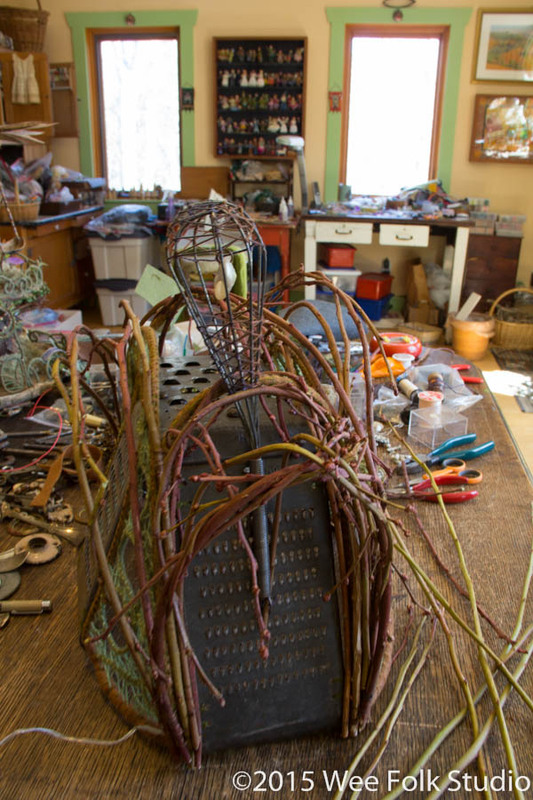 Then, I used my felt covered wire technique to form a base and arched beams. This single glove was in a box of my grandmother’s things. 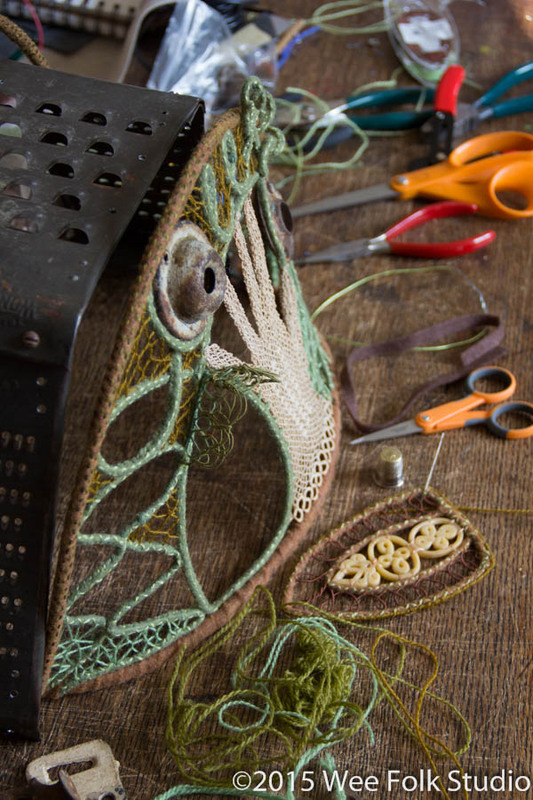 She and her sisters did a lot of tatting in the early 1900’s, so perhaps one of them made it. 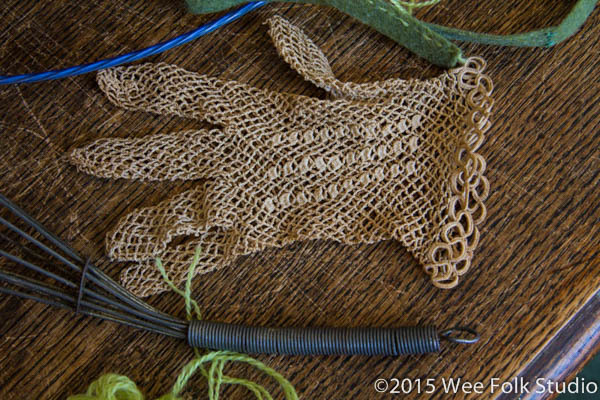 I incorporated the glove into the front wall, leaving room for a door opening and curled loops of felt covered wire. I stitched wool tapestry yarn in a zigzag pattern to fill in some areas, while leaving some open for viewing inside the house. I tried not to get too fussy, but the door required a bit more detailed work. I worked on the house during the snowy winter — my favorite time to be engrossed in a project. The whisk was another kitchen find that I added near the end. I pruned some supple branches off my blueberry bushes and lashed them to the grates with wire, adding a more organic façade. I wanted the interior to be magical, so I draped strings of glass beads and crystals from the ceiling. Tiny blue and white LED lights (run on batteries) added a glow as well. In the daylight, it’s hard to see the lit interior, so I sprinkled small round Shisha mirrors on the ground inside to reflect the lights and make it sparkle. 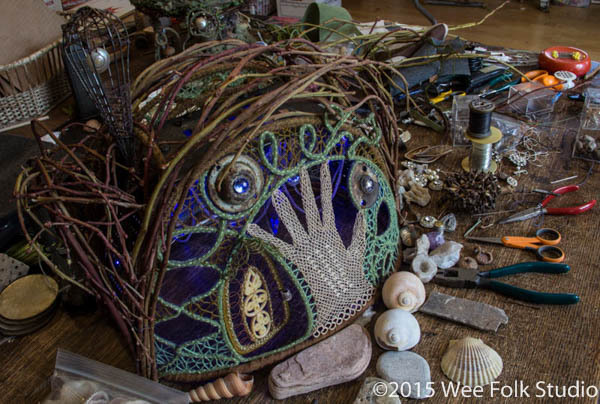 This entry was posted in Exhibits, Fairies, Fairy House of Highfield Hall, Fairy Houses, Found Objects, Sculpture by Salley Mavor. Bookmark the permalink. so beautiful….if i was a fairy, i’d want to live there, it’s a fairy mansion! I love this. Your ideas are magical. Thank you so much for sharing the house and the making thereof. It’s fascinating to see how it’s done, and at least a good second best to seeing this magical exhibit in person. I love the glove, and the use of graters. Alas, I live in a small house, filled to the gills with stuff. The things I find hardest to throw away are the seemingly least valuable things. I know I have some graters, too, buried somewhere in the basement. I can’t look at a object without thinking, “this will be good for some other use, someday.” It pleases me to see that mindset put into action with such delightful results. Not sure my husband would approve of me spending the rest of my life making fairy houses though. I am not Salley Mavor. But, bless your husband for being so supportive of your career as an artist, and letting us enjoy the results. 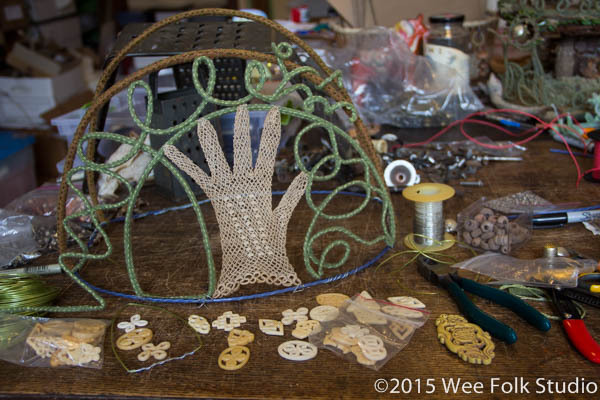 I daresay, there is a big difference between dreaming of “doing something with this someday,” and diligently sitting in a studio every day and doing something with your stash. It’s a continual delight to see what you create. Thank you so much for your thoughts and support, Cat. Hearing about your experience makes me realize that being a collector of interesting objects for creative endeavors can lead to judgement and misunderstanding by the people who live with us. To me, it’s healthy hoarding, with the potential for creative expression. To hold back from gathering things from our wonderful world would be like repressing a vital instinct. I just LOVE all your fairy creations! Would love to see them up close but I live sooooo far away, in Australia. Look forward to seeing more. 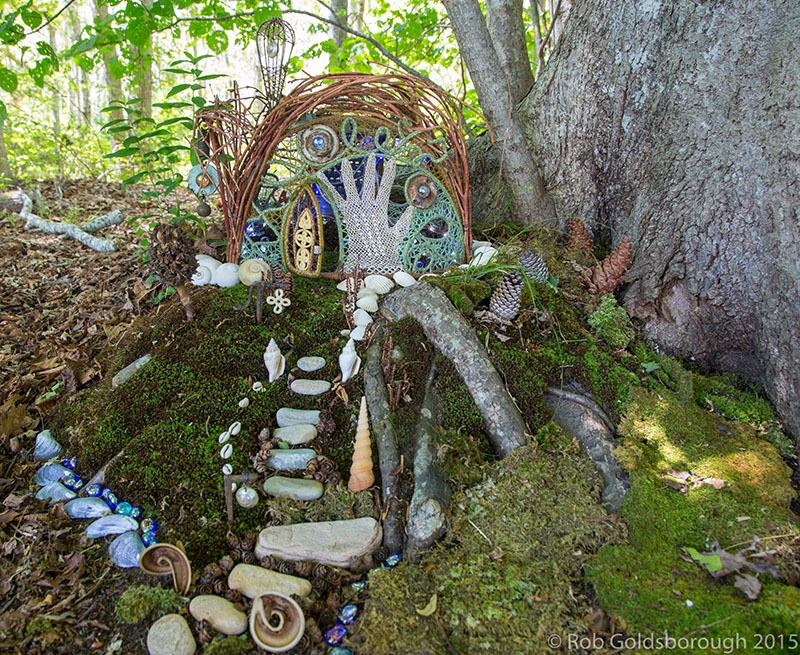 I really hope I can make it down to see the show- I love your fairy house and I’m sure the rest are amazing as well! You are such a genius!! !